1. 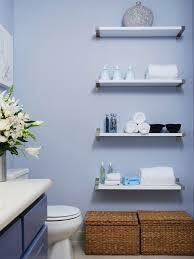 Remove all the ordinary toiletries such as toothbrush holders, razors, soap & shampoo bottles. Tuck these away out of sight.Remove your everyday towels. Remove the old shower curtain. Remove the rugs. Then clean the bathroom top to bottom until it sparkles. 2. Put a coat of fresh paint in white or a light taupe, tan, or grey. 4. Put up white open shelving if there is an open wall. Storage is something everyone needs more of. I begin by putting in a new white shower curtain and silver rings. I place 100 watt bulbs in the light fixtures. 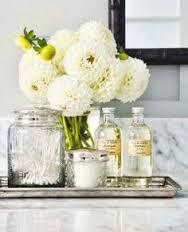 I accessorize the new shelves with hotel-white towels, a bowl of white guest soaps, a few white candles. 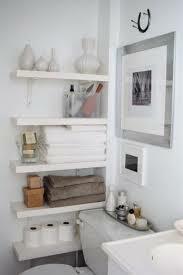 I place a large wicker basket in the corner with rolled up white fluffy towels or some magazines. 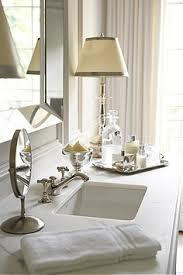 On the sink counter I place attractive bath products or possibly fresh white flowers, and a hand towel. The result is a simple, tasteful bath that will seem more fresh, bright and updated.